Don't start knitting any booties, the good folks over at Purex sent me a bottle of their new for babies detergent to sample and review. I have generally reserved my whites for Purex detergents since my homemade laundry soap doesn't seem to get them as bright as I would like them to be. And whites just happen to be the perfect loads of laundry on which to try out baby detergent since baby clothes are so often pastels. Which also happen to be the best colors for showing stains. My clothes have a very faint scent, not perfumey at all, and have come out clean and bright. 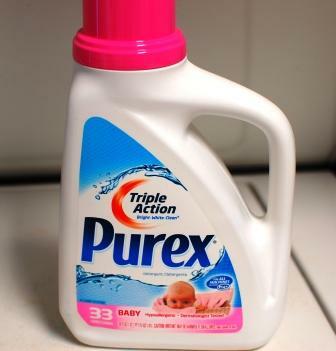 Purex designed this particular detergent with the needs of baby skin in mind. It is hypoallergenic and dermatologist tested to be extra gentle for infants. As always, Purex detergents are reasonably priced and this one is no different. If you would like to find out if a store near you carries Purex Baby, here is a store locator. Purex Baby also sent me three FREE coupons to give away to my readers. Thanks Purex! Sign up using the rafflecopter below. The winner will have three days after the drawing ends to contact me before I choose another winner. Good luck! Purex provided me with a sample of Purex Baby detergent in exchange for a product review. All opinions and dirty laundry are my own. The winners have all been contacted. Congratulations! I would be using the Purex product. Thanks for offering this! Totally interested in this product. Baby #1is due in 4 weeks! I'll be using it myself for my nephew and his sensitive skin. Both kiddos have eczema so I'd be using it for them! Oh we would use it! We currently use Dreft for Carters clothes, but its so expensive. I would love to find a good one to replace it that is still sensitive! would make a great addition to a gift basket for a shower gift! Always looking for a cheaper baby detergent I use all clear for the boys cloths right now. But it would be nice to have a little sent on the cloths. Oh bummer! I could have totally used this. I really wish that I could find this in a bigger bottle. My dog has allergies and I was hoping to use this on everything and not just the babies clothing. I do use it on their beds though.